Thursday, March 31, 2016 – ZIPPITY DOO DAH! It time for the 6th ANNUAL FONDREN’S ZIPPITY DOO DAH® WEEKEND, April 1-2, 2016 and SWEET POTATO QUEENS® CONVENTION March 30-April 3, 2016! to benefit the children of Blair Batson Hospital. That is correct queens. It is Sweet Potato Queen Parade Time in Mississippi. I hope Elf that you have your Queencentric on and that you and Miss Annie will attend this year. I am not able attend this year, but please know that I plan to have my own personal SPQ weekend beginning tomorrow with my pearls and pajamas party. A little music. A little dancing around the room. A few drinks. That sort of thing. Yes, it is a normal Friday night, but during ZIPPITY DOO DAH it is a pearls and pajama party! Wish The Twins were here from last year. Saturday evening, I plan to march up and down the street in my crown and boa and my Rodeo Queen outfit. Should I go with the inflatable crown or the diamond one? I hope those glitter boots from Zappos arrive in time. I plan to do this until I see the first police car. Jenny Lee W. – I AM NOT the Queen in drag. Sunday perhaps I can talk SPQ Ms. Navasota into a bathrobe brunch. I will take the Abuelos’ diablo shrimp and a very large thermos of bloody Marys to her house. Should we desire mimosas, I could also bring a bottle of champagne and a few drops of orange juice. Meanwhile – some photos from last year’s Zippity Doo Dah. Thank you Jill Conner Browne, for all that you do for all of us. Door Decoration from The Hilton Last Year. Her Royal Highness’ Newest addition to Grit Lit (Literature of the South) is Fat is the New 30 – The Sweet Potato Queens Guide to Coping with the Crappy Parts of Life by Jill Conner Browne. I will never win the Green Jacket at the Masters Golf Tournament. Heck, I can’t even play there unless Dr. Condoleezza Rice asks me. Even then I am not sure. But I can wear green pants. This was from the St. Paddy’s Day Tournament. They obviously brought me good luck though. Today concluded the Briarcrest Women Golf Association’s Eclectic Tournament. You play two rounds – one week a part and mark your improvement between rounds. With a Yes Indeedee score of 102 today I improved by 12 strokes – such a magic number in Aggieland. And then there were four teams from the Women’s basketball NCAA Division I. And Then There were four teams on the Men’s basketball NCAA division I. Then there were none – None of the teams of either gender that I care about. Headed to Women’s Final Four in Indianapolis, Indiana for the UConn Invitational will Geno and the Giants, the Beavers of Oregon State, the Huskies of Washington (Dub is actually an Alaskan Malamute) and the Orange Fluff Ball from Syracuse. Should have used last year’s bracket. Headed to the men’s Final Four in Houston are Oklahoma, University of North Carolina, Villanova and the Orange Fluff Ball from Syracuse. FYI – The Orange Fluff Ball is named – Otto the Orange. Headed to assist the Baylor softball and baseball teams to assist the pitching coaches will Kim Mulkey. For the sports challenged – in an act of frustration during last evenings Baylor/Oregon State game, Baylor women’s coach Kim Mulkey threw her most beautiful and very expensive gold jacket a good thirty yards in an act of frustration. Next year, Coach Mulkey, since you know going to receive a Technical foul anyway, throw your jacket at the referees. (NCAA Rule Violation Section IX, Paragraph 6, Part B, Sentence one – Jacket Throwing). Apparently the only three people in the arena and across ESPN who did not see the Oregon State player hold on to the Baylor player for good 1.4 seconds were the three referees standing within three feet. How many days until football season kicks off? This is for you – Elf in the Kitchen- wish you could have joined us. Every woman knows there is nothing like a crown on her head. And if there is a a convertible and parade it is even better. No convertible or parade this week end, but a fabulous Sweet Potato Musical and lots of tiaras and crowns. Here are the photos from the Queenly Weekend where we saw the fabulous Sweet Potato Queen Musical at TUTS Underground in Houston. Thank you for premiering in Houston. Thank you to the SPQs who gave us a free parking at the Hobby Center. Friday night – Sunset from the bar in the Hilton in downtown Houston – a bit of preparation for the next day. Always start the day with a glass of juice. My favorite is tomato juice. Such an awesome woman!!! Well, I mean she is THE SPQ! The Sweet Potato Queen of the Brazos Valley upon learning both Syracuse basketball teams won. Tonight we see who joins Syracuse and Washington (really???) for the Women’s Final Four. The good news THE University of Texas women made to the Elite Eight for the first time in decades. The bad news they play Geno and the Giants of UConn. Please let Stewie sprain her ankle as she exits the bus. Then it is the Beavers and the Bears. Sic ‘Em, Lady Bears. Or the Queen of the Brazos Sweet Potato Queen will not be happy! It is not nice to make the Queen unhappy! 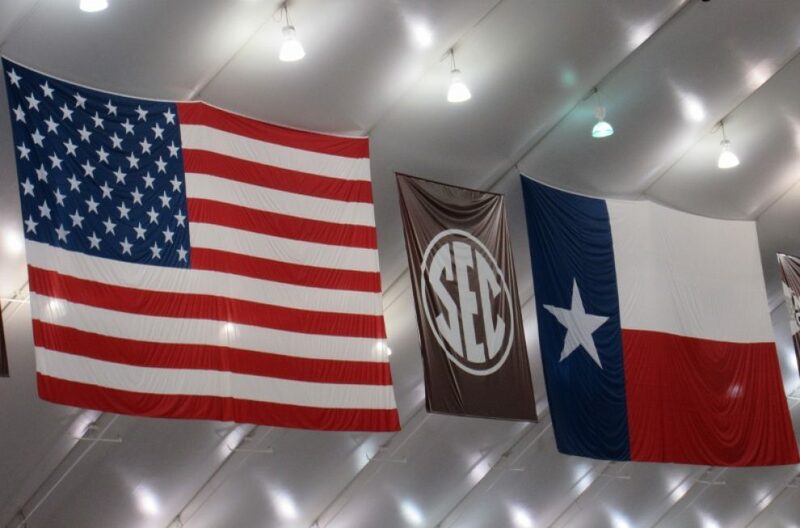 Great basketball season for both Texas Aggies teams. Rock, Chalk, Jay Hawk!How many days until football season? Bet you did not know The Easter Bunny’s name is Jumpin Jack Rabbit. I am holding him hostage until he gives me more chocolate and/or tells me where he hid the Golden Egg with all the money in it. In case you are interested, Tucker Alger, Wonder Dog, took this photo. I think Jesus probably would have played sports. Of course the only sport of the day was having the Christians eaten by lions and other forms of torture and He was not into that until the end. Thank God. He did seem to enjoy fishing. I think He would have played soccer, baseball and golf and all other sports. Why those three? Not only are those thinking sports, they are sports known for their diplomacy and etiquette and breaking social and political norms and rules across all geopolitical barriers. He was good at basketball too – of course He could play all five positions, but is best at point guard. He already had a team – The Disciples. Of course He would have played football. In Texas football is a religion. I think He would be #1 high school QB, then #1 college QB, and then first round draft choice, and then #1 in the NFL. But back to Holy Week. For all of us whose religious beliefs go back to The Kneeling Faiths, it is Maundy Thursday. Thus begins The Easter Vigils when Christians celebrate The Last Supper, the Crucifixion and Resurrection of Christ. So tonight begins my Easter Vigil. Of course there will be wine and candles and prayers offered. My Easter Vigil begins at 6:37 CST and not one minute SOONER! Isn’t this a Sooner Schooner? So here’s to Jesus and The Disciples and The Fighting Texas Aggies Men’s basketball team. Both are great at come backs! It was a dismal Pepto Bismal night at Reed Arena last night as the Aggie Women’s Basketball team was scalped by the Florida State Seminoles. Have fun in Dallas, Noles and tell the Baylor women hello. But wait – the fat lady has not sung for The Fighting Texas Aggie Men’s team. In the house last night was D. House. Monday, March 21, 2016 – Please Excuse – One Sweet 16 Ready To Go and One Sweet 16 on the Court Tonight. To Whom It May Concern: Please excuse all Stephen F. Austin Lumberjacks from work and school today because they lost by one point to Notre Dame. Way to go Jacks for almost another upset and for a great season. Please note: Do Not play Notre Dame on a Sunday – especially the Sunday that kicks off Holy Week. But that was yesterday and yesterday’s gone. Tonight coming to you live from Reed Arena in College Station The Fighting Texas Aggie Women will tip off against Florida State University. This is Anriel Howard. – Aka Lashes by her team mates. Check out the hair. Big Basketball Hair– Even I can see her eyelashes from my seats and I just had cataract surgery. Check out her legs. She is a two-sport athlete and will compete in the triple jump with the Aggie track team when basketball season ends. Her gait while running down the court is beautiful to watch. This young lady has it going on. Check out the fashionable shorts. Congratulations to #5 Anriel Howard. To the entire team: BTHO Florida State.